Happy 2nd Advent everyone! ‘Tis 17 more days till Christmas. I had a very calm advent all by myself, as my boyfriend was away having two concerts in one day. Having the apartment all to myself, I have to say I thoroughly enjoyed the day. I watched Searching for Sugar Man, a fantastic documentary that brought a couple of tears to my eyes. Then I went into the city to buy some chocolate to make these delicious black bean chocolate biscuits. Having turned on the oven for the biscuits, I roasted the butternut pumpkin right after the biscuits came out, and proceeded to make this Christmas salad creation of mine that I had in mind for some days now. I have been eating kale in salads for just over a year now. I thought it needed to be cooked, as the leaves are kind of tough to be eaten raw. But after reading recipes on other blogs, I learned if you marinade the leaves in something acidic like lemon or vinegar, the leaves wilt and become tenderized. This particular salad uses the best of autumn/winter vegetables. Roasted butternut cubes are a frequent guest in my kitchen, and roasting red onions bring out their sweetness with a slight hint of smokiness. 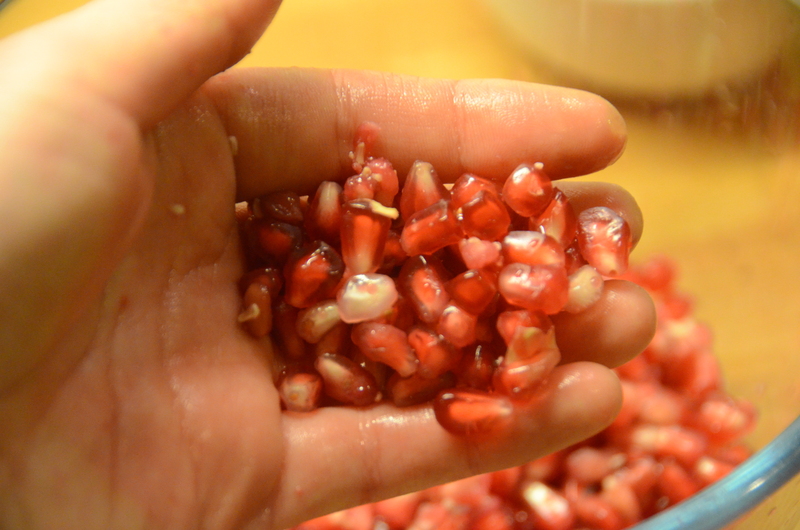 Pomegranate seeds not only look like pretty little pink jewels, the juice that bursts out when you bite into each seed taste lightly tangy and sweet. I tossed in some cooked chestnuts in the spirit of Christmas too. The dressing is made with heavenly brown butter that taste nutty (hence the name in french, Beurre Noisette), and you can detect all the Christmas-y spices like cinnamon, ginger, and vanilla. The taste of these spices are subtle, but I like it that way. If you would like more of a kick, then feel free to adjust the amount of spices. Have a nice week! And bon appetit! A Christmas Salad (Kale, roasted butternut&red onion, pomegranate, and chestnut salad in spiced brown butter dressing) – Phew, that was long! 1. Separate the kale leaves from the stalks. Discard the stalks. Chop the kale leaves into small bite-sized pieces. If the leaves seem to be tough, cut them into shreds. 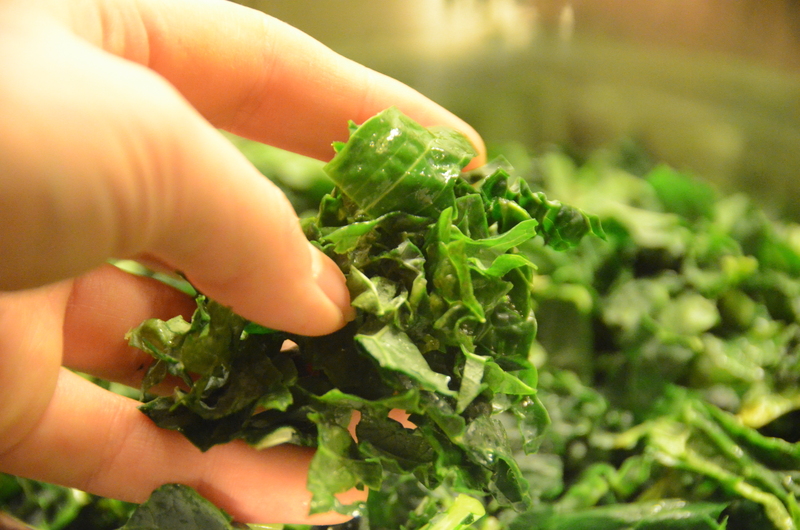 Toss the kale leaves with red wine vinegar, a good drizzle of olive oil, and a good pinch of salt. Massage the leaves briefly so they leaves soak up the dressing evenly. Leave for 30mins or more. This will wilt and tenderize the leaves. 2. Pre-heat the oven to 180 degrees Celsius. Peel and chop the butternut into big–ish cubes. Toss the butternut with red onion halves in olive oil, a pinch of salt and pepper. Lay them on a baking sheet in one layer, not too crowded, and bake for 20-30 mins until lightly browned and lightly tender. (check after 15 mins) The butternut pumpkin should not be over cooked. The cubes should retain their shape. 3. Make the dressing. Mix the shallot and vinegar in a bowl to macerate. In a small pan, melt the butter in medium-low heat. Keep heating the butter until there are brown bits appearing on the bottom of the pan. Keep an eye on the pan, as butter can burn very quickly. Once the butter smells nutty and brown bits have formed, pour it into the bowl of vinegar and shallot. 4. Add the ground ginger, cumin, cinnamon, and chili flakes (if using) into the melted butter. Scrape the seeds off the vanilla pod and add to the butter as well. Add the vinegar, salt (I added 1/2 tsp, but taste as you go), and pepper. Whisk to emulsify. Taste the dressing, and add more spices, or salt to your liking. 5. 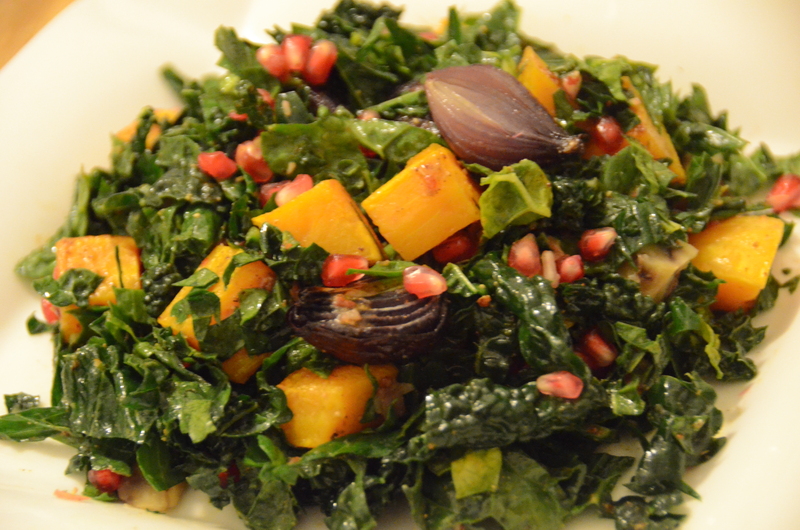 Toss the kale, roasted butternut, chestnuts, pomegranate, and roasted onion with half of the dressing. (gently!). Taste if the salad needs more dressing. Add more to your liking, but the dressing should not overpower the salad.